Downloadble audiobooks affiliate program. Earn money as an affiliate selling our audiobooks. Clickbank affiliates. 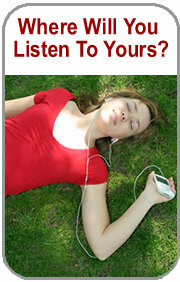 Earn 60% as an affiliate selling our downloadable audiobooks in mp3 format. All sales are tracked by a cookie to your affiliate id. and so you will be credited for any customer who comes to us through one of your links and then purchases anything from this site. You get paid by Clickbank.com every 2 weeks!